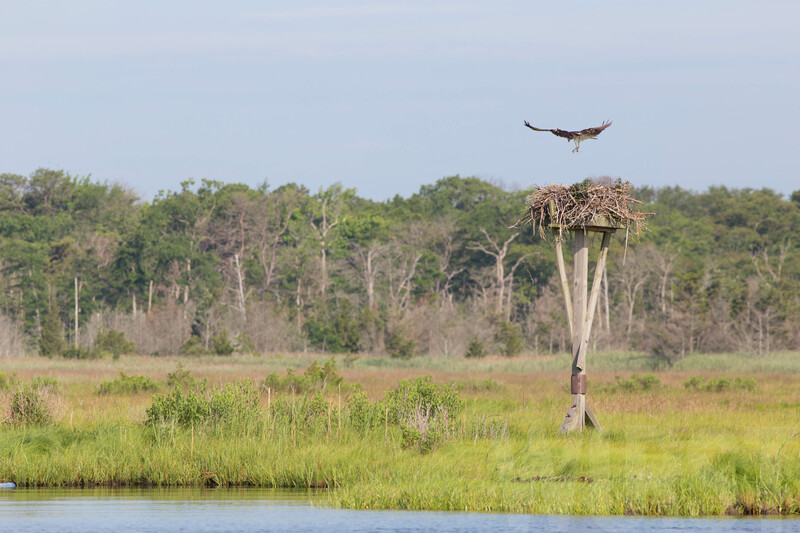 Support New Jersey’s ospreys with donations matching a $12,500 challenge to help Conserve Wildlife Foundation purchase a boat. Surveying a nest on Long Beach Island in 2017, the last year we were able to utilize a state owned boat. photo by Northside Jim. Ospreys are living barometers. They symbolize the resilience of life along the New Jersey coast. As a top tier predator who feeds exclusively on fish, their collective health is a direct link to the health of our coastal waters. Anyone can tell you that a healthy coast is essential to life at the shore. Clean water with abundant and healthy wildlife equals a booming shore economy. We have all benefited from actions and policy that have protected our air, land and water since the 1970s. Ospreys are no exception. NJ Osprey Project Volunteers Wayne Russell, Matt Tribulski and John King repair an osprey platform. New Jersey ospreys have headed for warmer climates until their return in the spring. NJ osprey project volunteers are busy repairing and cleaning out nests, adding predator guards and perches in preparation for the nesting season. It’s an endless job as there are 100’s of nesting platforms throughout the state and maintenance is always needed. These repairs keep the nests as safe as possible for the nesting ospreys. Thank you to all the dedicated CWF volunteers! 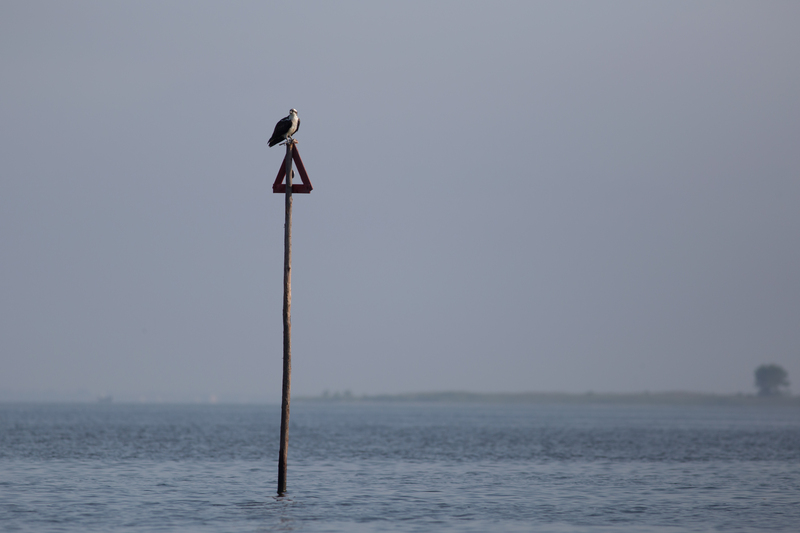 Ospreys are a common sight along the New Jersey shore during summer months. Each year myself and other dedicated volunteers conduct surveys of osprey nests by boat. Photo by Northside Jim. We use ladders to access nests. Photo by Northside Jim. We count the number of young produced. While checking nests the adults circle nests and often dive bomb banders, like myself. Dive bombed like this. Photo by Northside Jim. And this… Photo by Jim Northside Jim. Young are banded for future tracking. 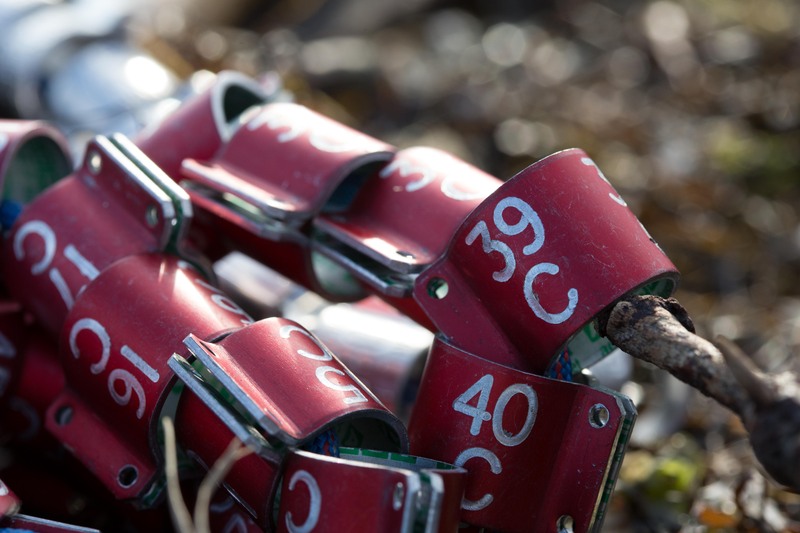 This year a color auxiliary band is being deployed on young that are produced on Barnegat Bay. While checking nests, with or without young, we clean out any trash that we find. Photo by Northside Jim. After surveying a nest the adults return to care for their young. Posted in Raptors, Wildlife Protection | Comments Off on Osprey Craziness! 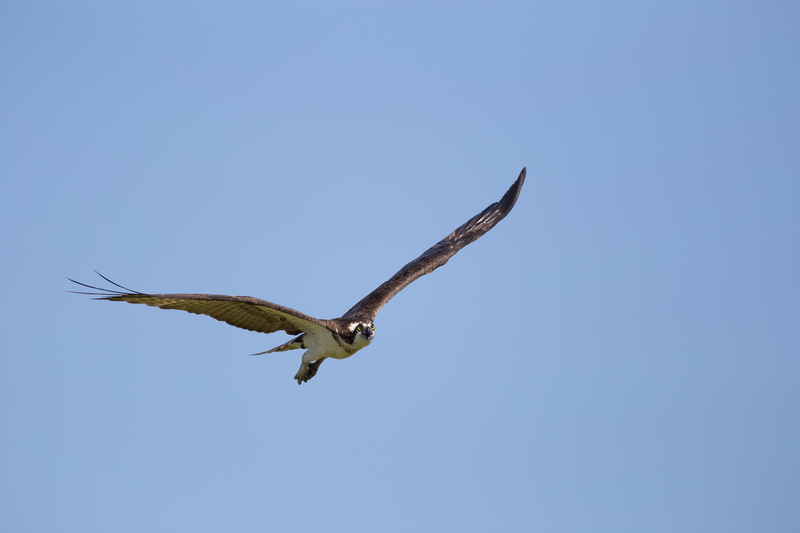 Surveys of nesting osprey have ended for 2012. 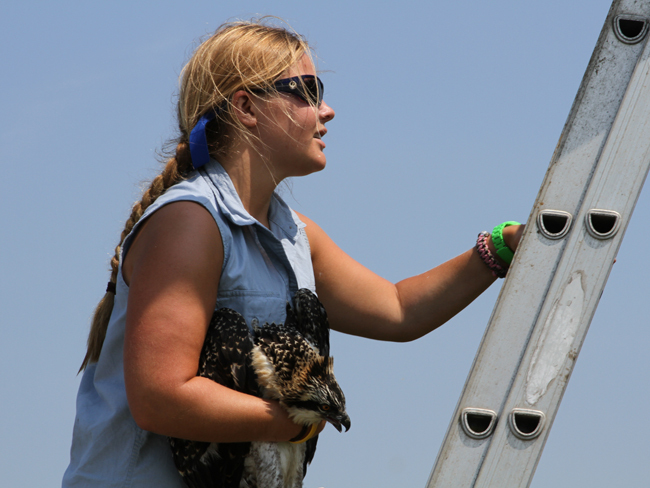 Each year volunteers, state biologist and CWF staff complete nesting surveys of ospreys. These “osprey banders” complete “ground surveys” (referred to as ground surveys because they are surveying nests by land/sea, not by helicopter) that cover around 70% of the state population. The surveys are meant to keep tabs on the state population and data collected from the surveys are used to determine the health of the population. Young are also banded for future tracking. Next year a state wide aerial survey will be conducted; the last aerial survey was in 2009 where 486 nesting pairs were found. We won’t know the total size of the population until then. Nesting success is mixed this year and is highly variable by different regions, mainly because of severe weather. I never heard of a “derecho” until this summer. According to Wikipedia it is “a widespread, long-lived, straight-line windstorm that is associated with a fast-moving band of severe thunderstorms.” A derecho hit Cumberland, Salem, Atlantic & southern Ocean County in the early morning hours on June 30th, right in the middle of the nesting season for ospreys. 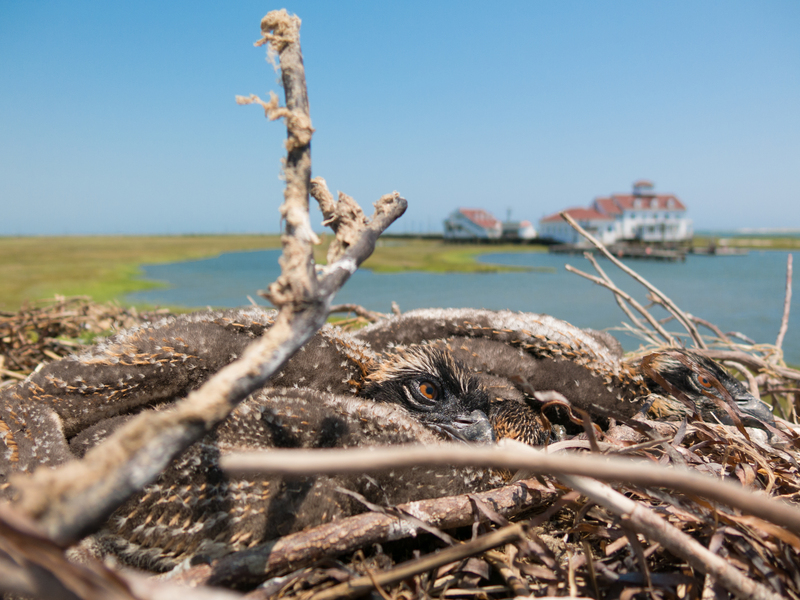 Weather plays a significant factor in the success of nesting ospreys. They nest in open areas, which makes them vulnerable to high winds and severe weather, and since they primarily feed on fish, water clarity affects foraging success. “In South Jersey, Atlantic City Electric reported that 206,000 customers lost power from downed trees. Most of the outages were in Atlantic County, which prompted a county-wide state of emergency. Near Atlantic City, a boater died while trying to bring his vessel ashore. Officials believed that lightning struck a 104-year-old church in Longport and caused a fire that damaged the building. An elderly couple was killed when a tree fell on their house. In Vineland, damage was preliminarily estimated at $125 million. On July 19th, 2012, President Barack Obama declared three counties in New Jersey (Atlantic, Cumberland, and Salem) federal disaster areas. This assured disaster relief through federal assistance to local and state governments and some non-profit organizations.” (from Wikipedia.com) I also know that two people were killed while sleeping in a tent at Parvin State Park. At this time most young were between 2-3 weeks old, with some a little older and some younger. All young are very vulnerable to severe weather, especially when wind gusts reach 70-100 mph, they can be easily blown from their nests and if not retrieved quickly could become food for ground predators or washed away with the tide. Winds gusted to 81 mph in Tuckerton, 74 mph in Absecon (Reported by the NJ State Climatologist Dr. David A. Robinson). In three areas that I survey (Absecon, Mullica River, & Little Egg Harbor) many young were either lost or blown from their nests and found dead or live on the marsh. In Absecon 9 of the 22 young produced had been lost or found dead on the marsh as a result of the storm. At a couple other nests to the north a few young were found on the ground shortly after the storm. Off of Great Bay Blvd. many nests that had young before the storm had lost them. One of our volunteers reported that many nests in Ventnor that were previously occupied had no young after the storm. 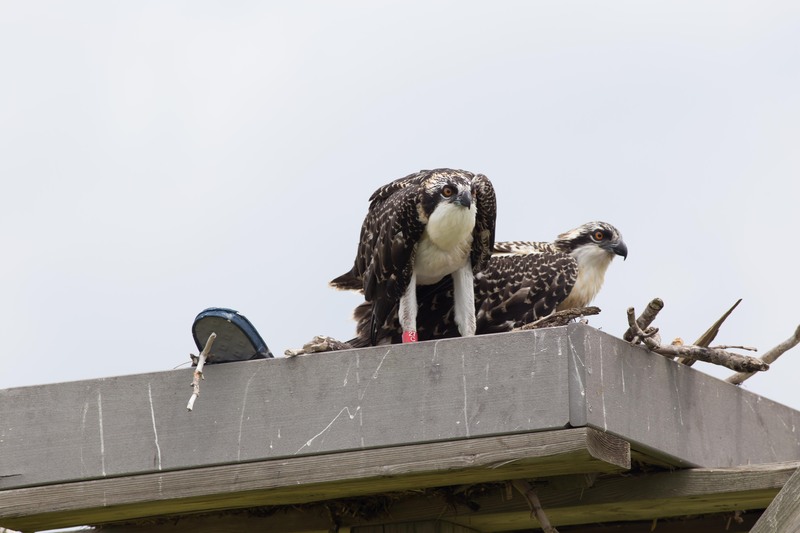 We can only hope that severe weather like this will not occur during the middle of the osprey nesting season again, but with a warmer climate these might become commonplace in New Jersey. One thing that we might consider is to take a long look at our current design for nesting platforms and look to see if we can make changes to allow for a deeper nest bowl. More of a problem is that some ospreys do not build substantial nests and use little sticks and branches, while others build large nests that are not easily blown away with the wind.